Yes as the title suggests this new year is going to be a relaxed one. I've had the most fun-filled December, so much so I honestly think I've partied myself out! But all that could change by tomorrow night and I could still end up out. Even if I was to go out I wouldn't be dressing up for New Year. For me, New Years is best spent at a house party with your close friends or family so dressing up isn't needed, as I probably get to a point in the night where I just want to curl up on the sofa chatting with friends. So if anyone asks, I will be wearing 'jeans and a nice top' because ultimately that is what I feel most comfortable in. 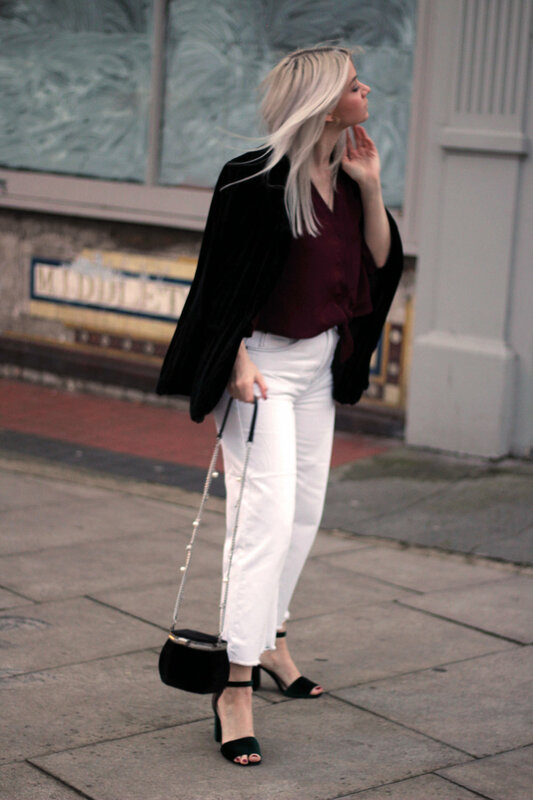 From this past year of blogging, I've realised just how much I love nothing more than styling my jeans. I make sure that everything I buy will go with my jeans collection, from my boots to jewellery. 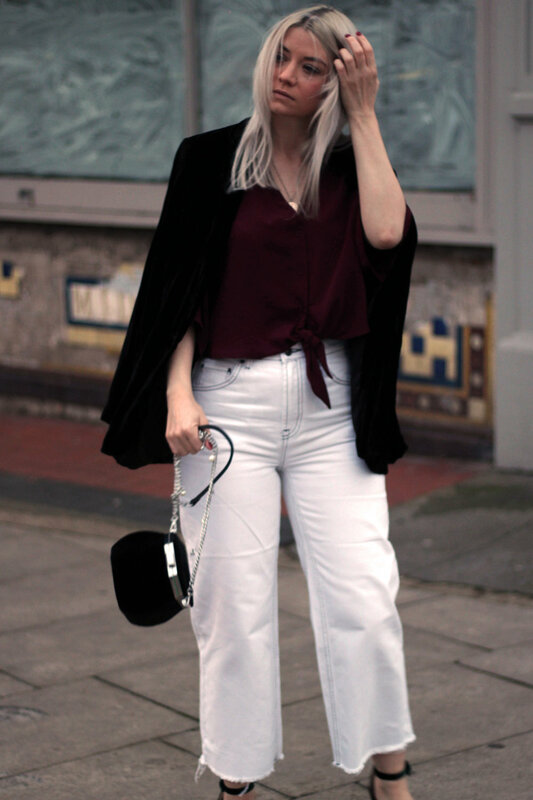 This classic me look started with these jeans I managed to buy in the Topshop sale a couple of days ago. In my last blog post Sale Shopping, I talked about the sales and how I think Topshop have the best jeans on the high street, there is no need for designer denim when the UK high street covers it so well. So when it comes to the Topshop sale I stock up on 3 pairs of jeans, as they are a steal at £22 each. For added contrast, I've worn this tie front burgundy blouse and an old favourite of mine, a black velvet blazer. Out of all the things I have worn this year these three velvet items have been high on my favourites list. My black velvet blazer which I bought in last years Boxing Day sales gets brought out for these kind of nights out. The green velvet chunky heels that I wore to fashion week, still some of my most comfortable going heels I own and my velvet, pearl chain bag. This bag gets so much attention I think because of the 1920's vintage styling. What I love about this look the most is that is mixes just a small most of newness and championing old favourites. This is what I intend to wear to see in the new year, fashionable comfortable. Here's to a Happy New Year guys and have a good one whatever you end up doing!